I made so many mistakes in this one – once again misjudged the size of my paper, tried to correct an off-centre line by putting in more line, thus accentuating the problem(left side above), keep on fiddling with the flame so it became completely without ambiance, and left too few “lost edges” by continuing coming back and doing more lines. The learning process is an uphill journey all the time…. So beautiful! And I think the flame just adds a mysterious prescence to the overall piece. I love it! 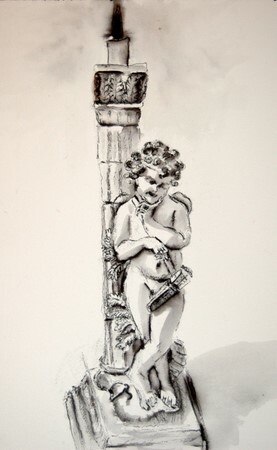 The cherub candlestick is exquisite! Great job. And all of your vine drawings/paintings are beautiful. This is my first visit to your blog – lovely! Thanks for visiting mine. This is incredibly beautiful! Such wonderful shading! Thank you everybody for visiting, I appreciate all your comments!